Amphibians are among the most endangered animals on earth with the threat of habitat loss, pollution, climate change, invasive species and emerging infectious diseases contributing to the decline in amphibian populations. While a large percentage of amphibian declines are linked to human activities, 48% of declines are classed as enigmatic with no identifiable cause. According to the International Union for the Conservation of Nature (IUCN 2014), of the 6,260 amphibian species assessed, nearly one-third of species (32.4 %) are globally threatened or extinct, representing 2,030 species. 38 of the 2,030 species are considered to be Extinct (EX), and 1 Extinct in the Wild (EW). Another 2,697 species are not considered to be threatened at present, while sufficient information was not available to assess the status of an additional 1,533 species (IUCN Category Data Deficient (DD)). It is predicted that a significant proportion of these Data Deficient species are likely to be globally threatened. The term "Threatened" refers to those species classified under IUCN Red List categories of Vulnerable, Endangered, or Critically Endangered. One of the biggest contributors towards the global decline in amphibians is thought to be largely attributed to the recent outbreak of Chytridiomycosis, a disease caused by the chytrid fungus Batrachochytrium dendrobatidis. The decrease in amphibian populations is occurring in every continent except Asia. However, not all species are affected by the fungus in the same way. Some appear to be exclusive carriers of the disease, displaying no obvious signs of infection, while others quickly fall ill displaying a 100% mortality rate. This places such species at risk of extinction. The fungus prefers cool moist habitats which puts high altitude, stream dwelling rainforest anurans at particular risk. It is predicted that the chytrid fungus prefer temperatures ranging between 17˚C-23˚C and die in temperatures above 28˚C. Where this fungus thrives, rapid declines are expected. Captive bred populations of amphibians are also at threat of contracting the fatal Chytridiomycosis due to the trade of wild caught specimens introducing the infection to captive animals. This disease was not apparent in Europe until 1997 when it made its first appearance in Spain. Declines driven by the chytrid fungus in Spain were documented in the Midwife toad (Alytes obstetricans) and salamanders (Salamandra salamandra) since 1997 and 1999 respectively. It was first observed in Italy in 2003, although is thought to have been present in Italy in an apparently non pathogenic form since at least 1999. 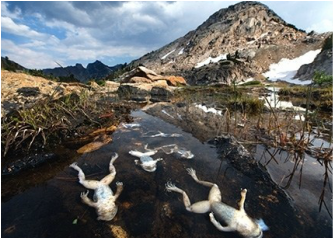 Shifts in climate change are hypothesised to be one of the contributing factors to the increased rate of global amphibian decline. The emergence of the disease appeared to follow a climatic shift or extreme weather event, positively demonstrating a correlation between climate change and disease outbreak. The Chytrid fungus infects and replicates within the keratinised skin cells of amphibians. The keratin layers of the skin fuse together causing hyperkeratosis which is a thickening of stratum corneum, producing an impermeable layer which could interfere with osmoregulation and normal oxygen uptake. Hyperkeratosis may also cause excessive sloughing, erosions of the epidermis and occasional ulcerations. The origin of the chytrid fungus is thought to have its roots in South Africa, where museum specimens of African Clawed Frogs (Xenopus sp.) from the 1930s display evidence of the earliest occurrence of the disease which was originally spread by the commercial trade of these animal. This disease is thought to be responsible for the recent decline of amphibian populations in Europe, Australia, Central America and North America. Climate change may be playing a large role in the alteration of local densities of amphibian populations as well as species distributions by increasing the rate of pathogenic outbreak and creating conditions which are more hospitable for the pathogen to thrive in, encouraging the growth of the fungus. Furthermore, changes within the climate may also decrease the immune defences of the animals, as a change in environmental conditions may trigger stress if the animal is unable to cope well with sub-optimal conditions. Within the highlands of Central and South America it is thought that global warming has triggered an increase in cloud cover over these areas due to an increase in temperature, this cloud cover results in a daytime cooling which is thought to shift in the favour of the fungus, thereby increasing the rate of pathogen outbreaks. As chytridiomycosis is a waterborne disease, it cannot survive desiccation. More-so aquatic species of amphibians appear to have a higher incidence of infection than that of terrestrial species, presumably due to this inability of the disease to thrive outside of water. Similarly, species which breed in streams or permanent ponds also show a higher rate of infection than those that breed in ephermeral ponds. Streams may also act as vectors for the disease as they are able to transport the disease form one location to another, carrying the pathogen over long distances. Other potential aids for the spread of this disease include species of amphibians with a resistance to the disease such as the Marine Toad (Bufo marinus), the American Bullfrog (Rana catesbeiana) and the African Clawed Frog (Xenopus sp.). These three species are also considered pest species and may act as reservoirs and vectors for future outbreaks. One of the largest contributors to the spread of the chytrid fungus is down to the largely unregulated trade of amphibians for pets or food. Millions of amphibians are shipped around the world each year, many of which are wild caught and potentially infected, facilitating the transfer of disease from one location to another. Infected frogs may contaminate captive populations or native wild populations if the infected animal were to escape captivity or be intentionally released. There are very few physical symptoms of Chytridiomycosis and in some species there are no visible symptoms at all. Infected larvae can be identified by evidence of damage to the mouthparts, which is the only keratinised area of the animal, but mature frogs may need to be tested for the fungus. There are two main tests that can be preformed to identify the presence of the disease: Quantitative Polymerase Chain Reaction (qPCR, or “Real time” PCR) which can be carried out on live animals and histology which is best performed on dead specimens due to the requirement for tissue samples. qPCR is a reliable test which detects the presence and quantity of chytrid DNA on a sample. It entails swabbing the most likely affected areas with a cotton bud i.e. the lower abdomen, back feet and webbing. Histology relies on microscopic examination and can accurately deduce the exact cause of death. Detection of the fungus is an important step towards prevention and control. Once the disease is detected in a population the extent of spread can then be deduced, and an appropriate course of action can be decided on. Rates of decline may be monitored closely to determine how badly the fungus is affecting the species and how much protection they should be afforded. It is also possible to predict the most likely places for the disease to inhabit by taking into consideration the environmental preferences of the disease by looking at its hydric and thermal requirements. By predicting possible sites of future infection, preparations for conservation may be taken such as data collection of current amphibian populations for closer monitoring and protection from other threats such as habitat loss and exposure to chemicals used for agricultural purposes allowing particularly vulnerable species the best chance of survival. Trade in wild caught amphibians should be restricted to prevent further introduction of the chytrid fungus into captive populations and to prevent the facilitation of the fungus into other countries. This would require international cooperation for it to be effective. Greater hygiene practices should also be considered by amphibian keepers as well as quarantining of suspected infected animals to prevent further spread of the fungus. To aid in the conservation of endangered amphibians, it may be required to collect specimens from the wild for captive breeding programmes. The animals may then be bred for resistance to the fungus. This method however may require the presence of mobile lab on-site, and a number of staff on hand which may be costly. Research into anti-microbial peptides and anti-fungal drugs has also been considered for the prevention of infection and the conservation of amphibians. Recent studies focusing on amphibians in Australia has revealed that species which thrive better in the presence of the fungus tend to have more effective anti-microbial peptide defences than those which are threatened or endangered, which indicates the potential of using anti-microbial peptides as an effective defence against chytridiomycosis. These peptides are naturally produced in the granular glands of the skin of amphibians and secreted in high concentrations as a protective defence against predators and pathogens, although the effectiveness of these anti-microbial peptides differs between species. Anti-fungal compounds may also be used in areas where an amphibian species may only exist within a restricted area such as the case with the Corroborree frog (Pseudophyrne corroborree) which was previously found in only one site in Australia, but is now facing imminent threat of extinction. Chytridiomycosis has proven to be a serious threat to amphibian wildlife and is a threat that should be taken very seriously. The current trend of rapid declines in amphibian populations can be reduced by removing human causes of species decline by protecting the habitats of species which appear to be most susceptible to the disease, attempt to reduce exposure to pollutants such as chemicals used in agriculture as such chemicals may interfere with the anti-microbial communities present of the skin of amphibians reducing the animals resistance, and also to restrict the trade of amphibians, particularly in animals of wild origin. There are also stressors which contribute to decline which cannot be controlled such as climate change, but changes within the climate may be monitored to predict potential increases in rates of disease outbreak, allowing for the preparation of conservation efforts. Invasive species should also be better controlled presenting native amphibians with the best possible chance of survival. There is currently no method to effectively control the spread of chytridiomycosis as the disease is still not yet fully understood, but attempts are being made to prevent the rate of spread by use of anti-microbial peptides and anti-fungal compounds to inhibit the growth of the chytrid fungus and slow down the rate of spread. Although the future may look bleak for amphibians, research on peptides as a possible defence is still being conducted as well as other anti-fungal solutions and possible vaccines.